For those of you that are American Homebrewer's Association (AHA) members and read Zymurgy, you are aware of their "You've Gotta Drink This" section. (If you are not an AHA member, consider joining. Even if you are not a home brewer, membership has great benefits like the pub discount program. 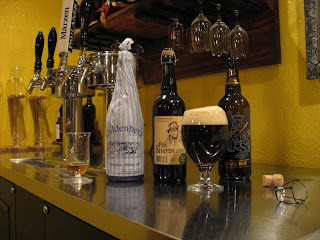 You can get more information at http://www.beertown.org/homebrewing/membership.html) There is a beer that I have fallen in love with called Gouden Carolus Cuvee Van De Keizer, so I submitted the entry below to Jill Redding, editor in chief of Zymurgy. I'm not sure if/when Jill will post my entry, but I thought I would share this will you all. Below is my submission. This beer is a must try, especially for Rochefort 8/10 fans. Its color is dark amber, and it pours with a sticky, long-lasting, off-white head. The aroma is huge and dominated by rich dried fruit flavors from the malt and the yeast. It is definitely a "Belgian" nose, though not phenolic or banana-ish like some Belgian yeast strains. Probably the most effervescent aroma I've experience in a non-hop accentuated beer. The flavor coincides with the aroma and is malty sweet with dark fruit undertones. There is no perceptible hop flavor or aroma. Aggressive carbonation keeps the beer from becoming too sticky in the mouth. Its finish is long and warming with more fruit and malt. Overall this beer offers a wonderful balance of yeast, malt and alcohol, and it is a must try for fans of Belgian Dubbels and darker Belgian Strong Ales! Side notes: On the beer shelf the bottle wasn't something that jumped out at me. But there was a small marketing sign below it stating "99 Ratebeer.com". I'm usually not swayed by this sort of thing, but I thought I'd give it a shot. I was blown away! Also, this beer is brewed once per year on February 24th. (Charles the Fifth's birthday) And different vintages are slightly different. The 2007 was 10%, and the 2008 was 11%. Despite the alcohol variation, the flavor is very similar. I doubt they are trying to make a different beer.